On a perfect winter's day for running, Gary Thornton of Galway City Harriers, enjoyed a great start to his racing year, winning this year's Allianz Resolution Run. Some 300 runners took to the streets of Galway on New Year’s Day for the annual 5K road race, with Thornton storming to victory in a fast time of 15:03. He was followed home by top junior athlete Ben Ryan of Craughwell AC, who ran 16:20, with Michael Kerrin also GCH third home in 17.03. The first woman home was Sinead Brody of GCH in 18:50, with Aisling Smyth of Bray second home in 19.16, and Athenry athlete Deirdre Brophy third in 19.26. First wheelchair athlete over the line was Craughwell AC’s Shauna Bocquet in a swift 16:20. The masters prizes were taken by Michelle Lynch of GCH, Sean McDermott, Castlegar, Ian Egan (Tuam ), Mary Molloy (GCH ), Andy Talbot (CRH ), and Judith Roche of Loughrea. There were encouraging performances from Galway athletes as the indoor track and field season has kicked off with the North West indoor games in Athlone IT at weekend. Sean McDermott of Castlegar clocked 10.04 for 3000m in a season opener. Jerry Keary of Craughwell cleared 1.95 metres in the high jump, while clubmate Laura Cunningham won the women’s high jump event with a 1.55m clearance. Craughwell also had high jump wins via Evan Hallinan, who soared to victory with a 1.55m clearance, and Jade Moorhead who jumped a brilliant 1.50m PB to win their respective U14 events. The Galway indoor championships will be held over two days on January 13 and 14, while round one of the National Indoor League takes place January 13. Galway City Harriers will field both men’s and womem's teams, led by Cliff Jennings and Majella Loftus, and both squads have a number of talented athletes, including Nicole King, Cillin Greene and Jack Dempsey. The prestigious IAAF Antrim International Cross-Country event takes place in Greenmount, Antrim on January 6 when GCH junior men’s athletes Eanna Folan and Thomas McStay, and Caron Ryan of Craughwell AC will compete for Irish junior squads in the Celtic nations race. Matt Lockett of GCH has been appointed team manager for the Irish U20 men’s team. 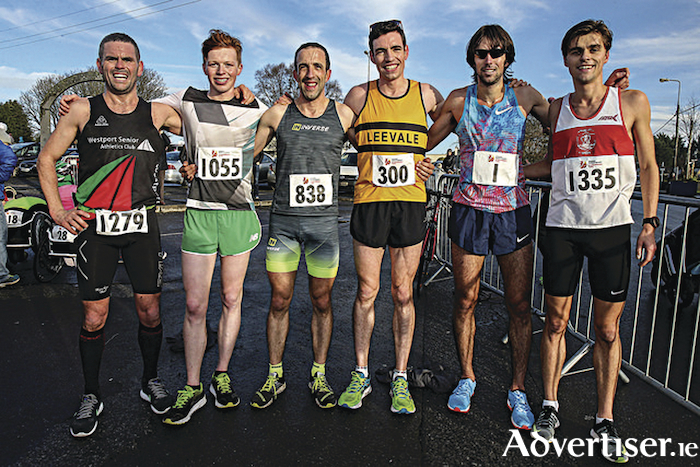 More than 1,000 athletes took to the fast and flat course for the 16th edition of the Fields of Athenry race, hosted by local club Athenry AC. Irish international Mick Clohisey of Raheny Shamrocks AC returned to win his sixth Fields of Athenry event in a row, and on this occasion he also set a new record, finishing in an excellent time of 30.21. Keith Fallon of GCH run strongly to take second in 32.34, and Barry Donovan of Leevale AC of Cork was third home in 32.42. The first woman home was Athenry AC athlete Jane Ann Meehan of Athenry AC in 37.39, Colette Touhy of Mayo AC was second in 38.32, with Athenry native Sinead Brody of GCH third in 38.51. Masters category winners were Deirdre Brophy of Athenry AC and Tim Jones of GCH at O40 level, Eddie Newman of Mullingar Harriers and Mary Kealy, Athenry AC at O50, and James Kenny and Mags Glavey of Mayo AC at O60 category. Ben Ryan took the junior men’s honours in a superb time of 33.41, while his sister Caron won the junior women's category. Cillian Dunne and Shauna Bocquet were the victors in the wheelchair race.